YumVeg.com - Bless These Beans! If you haven’t already, you can thank Karen for this. The big question is always, “What can I cook for supper tonight?” The answer will be more welcome if it’s simple, fast, and you have the ingredients in-house. I like to use things from my pantry, and keep my pantry stocked (most of the time) with some staple ingredients. We’ll leave those items for another post another time. Today’s meal only needed a few simple ingredients, and it was prepared and on the table in under an hour. Before you start anything else, put your rice on to cook. The fail-safe way to prepare rice is to measure your water and rice into the pan, put the lid on, and turn the burner to high heat. 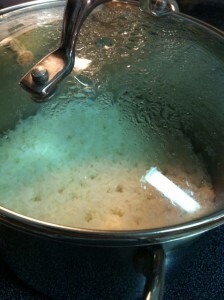 I like to throw a clove of garlic into the pot to cook along with my Jasmine rice. Keep a close eye on it (I always have a mess when I don’t), and allow the rice to boil for a couple of minutes, and then turn off the heat completely and walk away. If it’s white rice, it will be finished cooking in 20 minutes. If you’re preparing brown rice, leave it alone for around 45-50 minutes. But whatever you do, do not remove the lid. Chop your onion (if you prefer less onion, use less, but how can you ever go wrong with more onion? 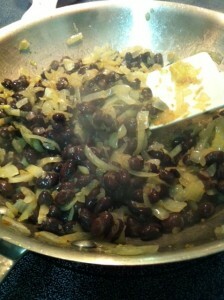 ), and heat some oil in your skillet over medium-high heat. Add the onion, coating it with the oil, and cook for a couple of minutes until it smells fantastic. 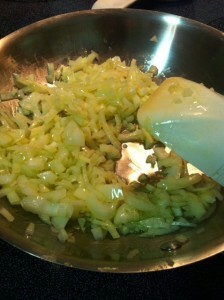 Next, stir in some garlic (again, I always use a LOT of garlic, but start easy and use one clove, scaredy cat) and cumin. Stir this deliciousness around for a couple of minutes, and then add your beans (which should already be rinsed, drained and ready) and 1/4 teaspoon salt. Be sure to coat everything well, and heat this entire mixture through for a couple of minutes. Your mouth will be watering at this point, and that’s a good sign that you’re almost ready to eat. Slightly mash everything together, but don’t pulverize it, and remove the pan from the heat. This portion of your meal is now ready, but wait, there’s more! 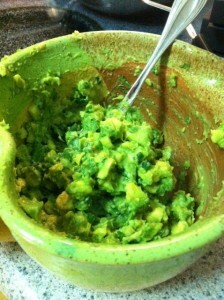 Better than icing on a cake, is a great homemade guacamole. This is the easiest thing to make, and requires absolutely no skill. Trust me, I’ve been making guacamole long before anything else I made was edible. All you need are a couple of avocados, and we’re ready! 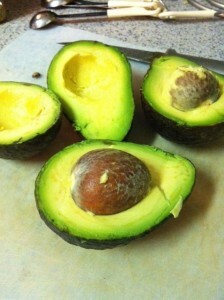 Gently slice open the avocados, and remove the pits. Scoop out the flesh, chop it, and place it in a bowl. Chop some green onions (two-three) and cilantro and add them to the bowl, too. Slice a lime and squeeze all the juice you can muster out of it into that same bowl. Add a little bit (no more than 1/4 tsp) of salt, and stir everything together and you have the yummiest guacamole in the bowl in front of you. 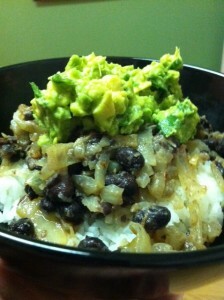 Grab a bowl and place some rice in the bottom, a scoop of your beans and onions next, and top it all with a generous helping of guacamole. I stirred mine together to blend all the flavors. A lot of flavor combine to make this a very filling meal using some basic pantry staples. I modified the beans preparation from a recipe I got from my friend Erin Absher, who eats the beans and guacamole in a pita. Tags: Tagged with: Beans, What's for supper? One Response to Bless These Beans! OMG! My mouth is truly watering. All I’m missing is avacado and lime. You’re right, stuff you have around the house. Why did you never tell me how easy it is to make rice? I’m off to the store.